Hmm, something funny going on here. This is a bug blog – specifically a beetle blog, yet it’s a post about a lizard that generates a flurry of comments. I don’t know if lightning will strike twice so quickly, but I did have this second ‘lizard’ post already lined up in the queue. The day after seeing a couple of male eastern collared lizards at Four Canyon Preserve in northwestern Oklahoma, I got my second saurian treat with this horned lizard (genus Phrynosoma). There are actually some dozen species of horned lizards in North America, but the majority are found further west in the U.S. and down into Mexico and Central America. Of the two that occur in Oklahoma, this particular individual can be identified as a Texas horned lizard (P. cornutum) by the two occipital (back of the head) spines, presence of lateral abdominal finge scales, and dorsal white stripe. 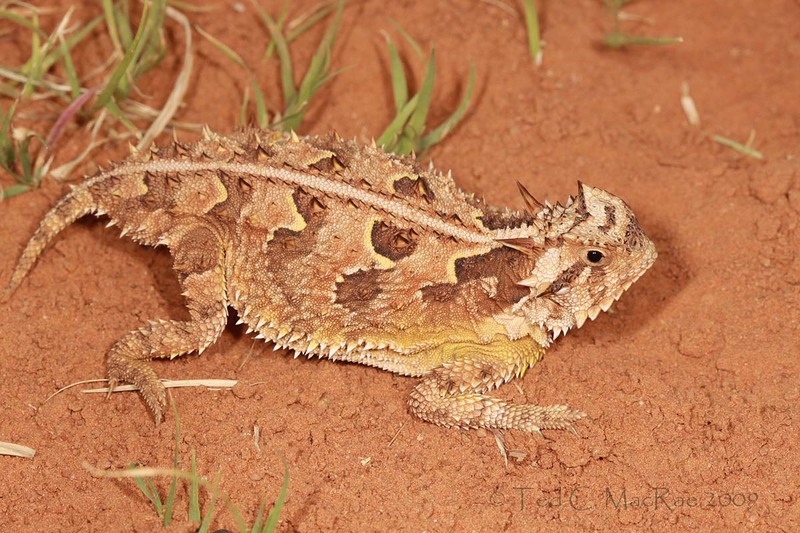 Oklahoma’s other horned lizard (round-tailed horned lizard, P. modestum) is restricted to the northwestern corner of the panhandle and differs from the Texas horned lizard by having four occipital spines, lacking lateral abdominal fringe scales, and more solid pale coloration. Again, my claim of “most bizarre” might be open to debate, as there are certainly many bizarre lizards in North America. The gila monster once more comes to mind, but I think grotesque is a better descriptor for that animal, and the fan-shaped toe pads of geckos might also get them some votes. Nevertheless, do a Google search on the phrase “bizarre North American lizard” and the results will be overwhelmingly dominated by references to horned lizards. It’s no surprise – their squat body form is more suggestive of toads than lizards¹, for which they are commonly called “horned toads” or “horny toads,” and their covering of “horns” (actually modified scales) gives them an otherworldly, almost dinosaurian appearance. Who among my generation wasn’t terrorized by the sight of these lizards, cheaply magnified, as they threatened the scientists that encountered them in the 60’s sci-fi classic The Lost World? ¹ Even the genus name, derived from the Greek words phrynos (toad) and soma (body), alludes to its toad-like appearance. In reality, these lizards are anything but terrifying. Instead they employ multiple strategies to avoid being eaten themselves. These adaptations were all on display as I initially passed this individual without even noticing it lying motionless in the middle of the road. Once I had passed I noted movement out of the corner of my eye and turned to see it scurrying towards the vegetation along the side of the road. It’s mottled coloration, blending well with its background, and spine-broken silhouette made it almost invisible. Feeling threatened by my too-close approach, it made a rapid burst for cover, but I cut it off at the pass and blocked its erratic scampers towards the roadside to keep it out in the open so I could take some photographs. Once cornered in the open, it resorted to a third strategy – puffing of the body to make it appear larger. Had I been a true predator, it would’ve had two more strategies up its sleeve that it could have employed as a last resort – bleeding from the eyes (which apparently has a foul taste and will cause a predator to drop the lizard from its mouth) along with the mechanical defense of its hard, spiny scales. Since I didn’t actually try to eat this little guy, I didn’t have a chance to experience these final lines of defense. The photos here actually represent two individuals – the middle picture is a second lizard that suddenly appeared while I was photographing the first. The second individual was somewhat smaller than the first and not as boldy marked (note the lack of a distinct dark stripe behind the eye). Whether these were male and female is difficult to say – horned lizards lack outward sexual characters allow them to be easily distinguished in the field (females do tend to grow a little bit larger). 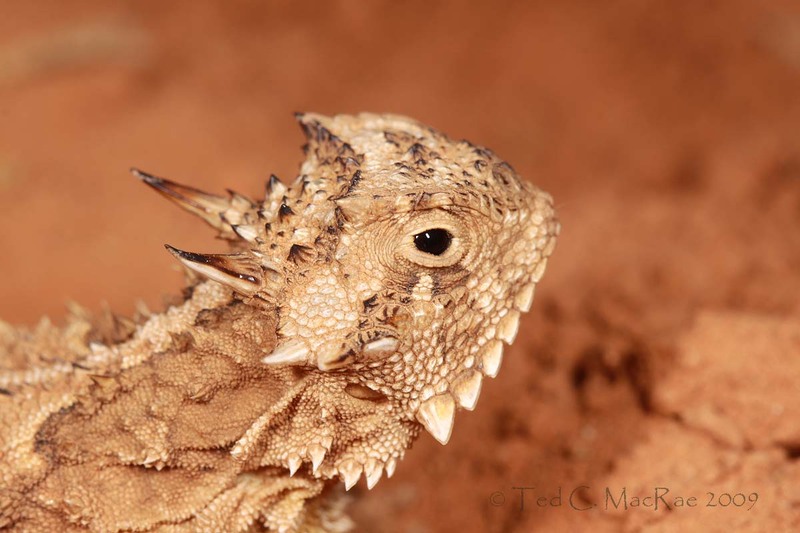 While not threatened or endangered, Texas horned lizards, like many other horned lizard species, have experienced dramatic reductions in its range. 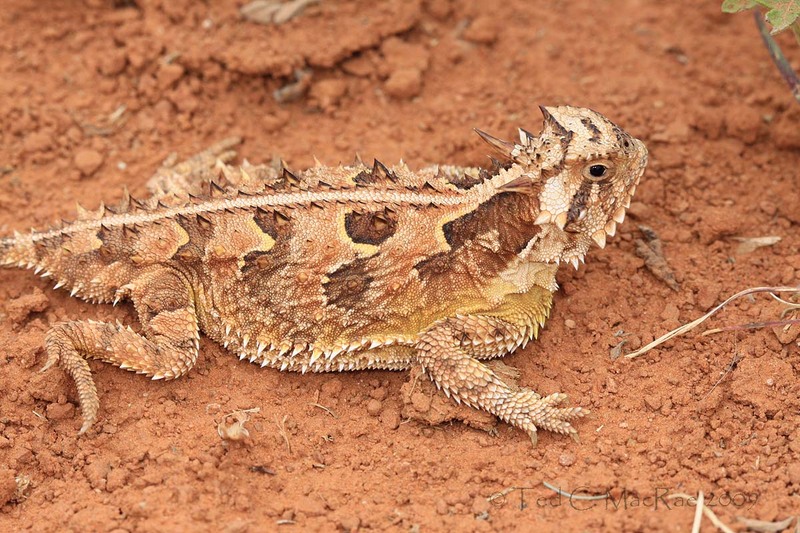 Oklahoma has a year-round closed season for both species that makes it illegal to kill or capture horned lizards without written permission. I would see a few more of these fascinating little lizards during my three days at Four Canyon Preserve, suggesting that, at least in this part of the state, horned lizards are doing just fine. Photo details: Canon 100mm macro lens on Canon EOS 50D, ISO 100, 1/250 sec, f/11-13, MT-24EX flash 1/4 power through diffuser caps. This entry was posted in Reptilia and tagged behavior, conservation, crypsis, Great Plains, herpetology, lizards, nature, North America's most..., Oklahoma, prairies, predator avoidance, reptiles. Bookmark the permalink. Hmmmm!! Somthing is really strange here! Are you getting old and forgetful Ted? I come here to look at bugs not lizards. 🙂 But while I am looking, I must say this is not the hansomest fellow I have ever seen but he is very unusual. Anyway, I do love lizards too so not a problem. I am so glad you managed to stop it getting away long enough to take these great pics. Hi Joan. I think he is just beautiful 🙂 Of course, beauty can be defined many ways. I’m fascinated by the multitude of predator avoidance strategies employed by these lizards. At least these don’t chase down tiger beetles! Their diet is almost exclusively ants and their fat body is due to the long digestive tract packed inside. One of Australia’s strangest lizard, the thorny devil, looks much like a horned lizard but is in a completely different family. The need for a long gut for ant eating leads to a fat body, slow running, and presumably, cryptic coloration and lots of spines for defense. However, the Australian thorny devil hasn’t evolved blood squirting! Interesting – I knew they specialized on ants (harvester ants I believe) but didn’t know the long digestive tract was a result of that. Fascinating how that morphological constraint leads to adaptations in so many other areas. Thank you, Alex. I’m a rather adventurous fellow, but I would draw the line well before it got to putting the thing in my mouth! I say keep the lizard pics coming! I love em! I saw my first horny toad on a hike in May. Two coast horned lizards (Phrynosoma coronatum), in fact. They are beautiful creatures and don’t mind so much being picked up. They especially like it when you rub their belly! Hi Kolby – gorgeous lizard in your photo. I don’t think the two fellows I photographed would have been too happy had I tried to rub their bellies. Personally, I’m glad to it’s illegal to keep them as pets. I know many reptile keepers do so with the greatest of care, but there will always be that percentage that allows them to languish in neglect. As a good scientist, I think you start tasting critters you are studying. And stopping to photograph a lizard qualifies in my book. I have tasted a few things in my time, some I can safely say,don’t bother. Hi Kirk. I’ve tasted many insects – willingly and unwillingly – and one time even ate a soft-shelled crab alive. But I couldn’t for even a second contemplate putting that thing in my mouth to see if I could get it to bleed! I dont think tasting these creatures (lizards and insects) is advisable. Who would want to kill and eat lizards anyway? Far too bony I think! Keep up the great natural history field work and photography! Hi Trevor – thank you for the nice comment. I’m just going to presume that Kirk’s recommendation was made “tongue” in cheek. Ted great post, don’t mind if you do lizards, this one is my favorite. I was disappointed to find out some time ago that it was illegal to have one as a pet now, as I wanted one. There are people allowed to have them as “foster” pets who take care of sick and injured fellows. My buddy had one back in the mid 80’s when I was in the Army in New Mexico and they make great pet’s. The pic’s are stunning as usual. Hi Mike, thanks for stopping by and for your nice comment. With your talent at rearing insects, I’m sure you would do real well keeping a horned lizard. Too bad you don’t live somewhere where you could become a “foster” keeper. When the first pic loaded, for a split second I thought “Oh Ted came to Australia and found a thorny devil”! Some striking similarities as Dave mentioned. I’m enjoying the little herp interlude also. I grew up catching and playing with “horny toads” in the Coastal Prairie of the middle Texas coast. The story spread among kids was that they could shoot blood out of their horns and if it got into your eyes, you’d go blind – a tiny bit of fact amid a sea of fabrication. The horned lizards must have to feel really threatened before the bleeding from the eyes defensive tactic is employed. Just being captured and played with was never enough provocation. At that time, horned lizards were as abundant as skinks and fence lizards are here in the Ozarks, and a lot easier to catch. Now they are rare. I don’t know if it’s true or not, but many people claim horned lizards were a casualty of the battle against fire ants. I can see how such myths can take hold among youngsters – maybe it actually saved a few from being molested. In addition to the spread of the red imported fire ant, its decline has also been attributed to changes in land use, increased pesticide use, and a growing pet trade. The true impacts of these factors remain a bit of a mystery, making it difficult to design management practices that can help to restore it. Gorgeous lizard Ted, I enjoyed your article about both lizards. Reptiles hold a special place in my heart. They are such fun, unique creatures, glad you deviated from beetles for a short time to share these great finds. When Kenton was little, he had a plastic replica of a ‘horney toad’ that was his favorite toy. We’ve never seen a live one, but your pictures sure brought them to life for us! What an amazing animal! Ted — I protest! You posted a lizard, and an ant-eating one, to boot. Forgiveness will only be forthcoming when you post on ants. Thanks, Beau. It was indeed a treat. Great post and fantastic pictures. We certainly don’t see the horned toad very much anymore here around Ft. Worth. It’s a shame. Thanks for sharing this. I see you have been busy. I’ll catch up as can. I’ve started to blog again and have some good photos lined up. I’ll try to post on a 2-3 day schedule. A Three-Banded Grasshopper is posted. To see the post, Click here. Hi Troy – thanks for the nice words, and welcome back! HoH a territorial dispute between two bullfrogs. I’m not sure where I first heard the word used in that manner, but I liked it well enough to look for a chance to use it myself. Thanks for visiting and for your equally interesting contribution to HoH. Hi Ted – I almost squealed with delight when I saw the subject of your HoH post! Like Marvin, I grew up playing with horny toads. I lived in Midland, TX (west tx) while in grade school, and our daily entertainment involved going out to the vacant field behind our house to catch horny toads and lizards. It was never a problem to find them – lots of them. And we could usually catch them – the trick was to get ahead of them and bring your hand down in front of them…because the horns on their heads hurt your hand if you misjudged. We always let them go back in the field when it was time for dinner. Oh, and my dog would play with them too, getting the blood-squirt. No, my dog didn’t like that much! My family moved to the Dallas/Fort Worth area and I haven’t seen one since. I was truly saddened to learn that they are in such decline here in Texas. My license plate features a horny toad…and I’m on a mission to seek them out this summer. Maybe I’ll have a horny toad post this year too! I feel like I missed out on an important part of childhood not seeing these things when I grew up (not much to see in the way of natural delights in urban KC). I guess I’m making up for it now. Good luck on your quest to see one again. Maybe you’ll get lucky and find a round-tailed horned lizard, Phrynosoma modestum, which has four horns on the back of the head.